When the temperature dramatically drops you need a de-icer that really performs and the 6902 De-icer from LIQUI MOLY is perfect for the job. 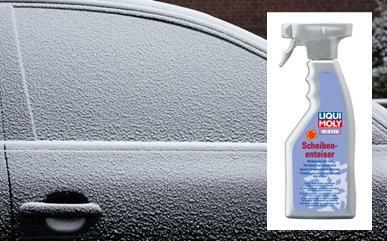 Developed from use in tough sub-zero European conditions it quickly and easily clears car windscreens of ice and frost. Its special formulation includes screen cleaning agents, is kind on paints, rubber or plastics and prevents rapid re-freezing. Anyone who uses this outstanding product never wants to use another De-icer again. Available now at special discount price.